Come Bowling and Putting with us! St. Andrews town centre in sunny Kinburn Park, one of St.Andrews' top tourist attractions. the town centre and parking. Kinburn Bowling Club President, Management Committee and Members. 'Opening Day' is Saturday 13th April at 2-00p.m. Starts our Bowling Season for 2019. Our popular Chicken and Egg ​nights start on Monday 22nd. April, 2019. Continue every Monday Evening at 6-30 pm. throughout the season. Ordinary / Associate & Social Members £1-00p. All those wanting to try Bowling are welcome on the night. person with the lowest score, the ​Eggs. Kinburn B.C.also play in the East Fife Bowling League, District 7. Crail, Elie, Lundin, St.Monans and Pittenweem Bowling Clubs. League Matches, normally played Wednesday Evenings. We operate a Car Share scheme to each away fixture. 2019 Bowling Season are always welcome. KInburn Members (Ladies and Gents) always enjoy our Annual Programme of Friendly Matches. Cupar Old, Ceres, Kemback & Balmullo Bowling Clubs. 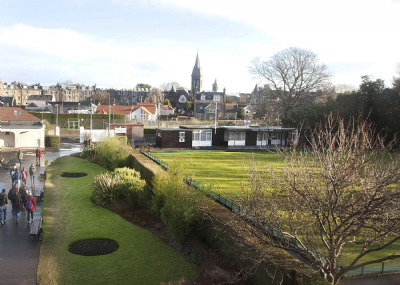 Kinburn Ladies also play against St Andrews and Lundin Bowling Clubs.